This entry was posted in ARMED CONFLICT, COUNTERINSURGENCY OPERATIONS, GLOBAL DEFENCE NEWS, NIGERIA, NIGERIAN ARMED FORCES, RISK ANALYSIS, SECURITY ISSUES AND CONCERNS, TERRORISM, Uncategorized, WEST AFRICAN STANDBY FORCE and tagged ANTI BUNKERING OPERATIONS, ANTI-PIRACY OPERATIONS, COUNTERINSURGENCY OPERATIONS, JOINT SECURITY TASK FORCE - OP RESTORE ORDER, JOINT TASK FORCE - OP PULO SHIELD, LITTORAL WARFARE, NIGERIAN ARMED FORCES, NIGERIAN ARMY SPECIAL FORCES, NIGERIAN MILITARY HISTORY, NIGERIAN NAVY SPECIAL BOAT SERVICE, RALCO 20MM CANNON, TERRORISM, URBAN GUERRILLA WARFARE. Bookmark the permalink. The Nigerian Navy practically popularised this weapon for its manufacturers. It first entered NN service in 2009 when we took delivery of the Suncraft Sea Eagle Mk.II OPCs and in much the same way as the military have acquired Singapore Technologies Kinetics .50 calibre HMGs by the high hundreds and many dozens of their 40mm Automatic Grenade Launchers, the Navy have settled for this weapon as a mainstay ala the 30mm Emerlec/40mm Breda before now. The RALCO 20mm is both remotely and locally controlled – that is what ‘RALCO’ stands for. 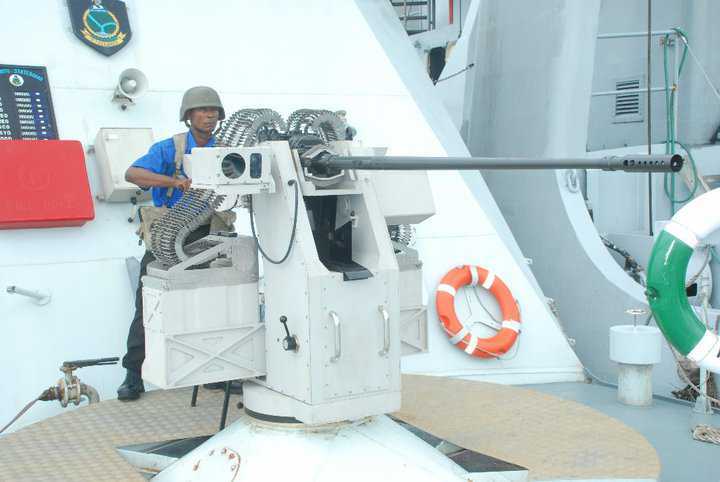 It is the main gun on the Made-in-Nigeria NNS Andoni P100 and is mounted as CIWS on the NNS Thunder F90, among other vessels. 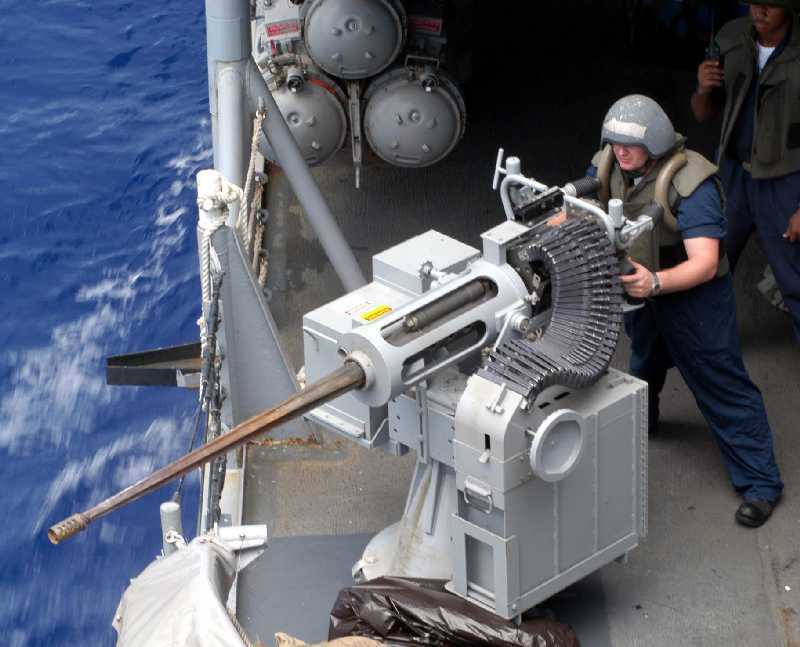 The fact of this weapon being mounted as CIWS on NNS Thunder F90 became known to me after I saw TV footage of the Exercise Farauta last month. It was clearly visible on the starboard side. I have forgotten what CIWS stands for please educate me. I think this is an Mk-38 25mm. Naa Henry, they merely look alike. Ditto the Bushmaster. When the Sea Eagle Mk.II were on the verge of being delivered in 2009, it was made clear that they would carry the RALCO 20mm cannon made by Suncraft. At the same time, the Shaldag FPCs were supposed to come with Rafael(Israel) Typhoon weapon stations. Looking at this photo, you can see that it is marginally thinner. We have not been privileged to see the technical data sheet of this vessel but my mind tells me that the fore-mounted weapon I see is the ultramodern Suncraft RALCO remote and locally controlled 20mm cannon. Here is a RALCO 20mm cannon mounted on our pair of Suncraft 38metre Sea Eagle OPCs. The 20mm RALCO Naval Weapon Station (NWS) is a gyro-stabilised, remotely operated small calibre gun system with manual back-up operation. It is suitable for deployment as main gun onboard smaller vessels or as secondary gun onboard larger vessels providing an inner layer of protection, offering surveillance and suppression capabilities within a coordinated network of ship based weapons & sensors systems. The RALCO NWS utilizes a 20mm rapid fire automatic canon as its main armament. The main armament is dual fed, which provides firing function redundancy and allows the operator to select the most suitable ammunition type depending on operational scenario. This feature is essential in modern day naval operations in littoral regions as it enables the operator to graduate to the next level of intervention or lethality (warning shot,disabling shot etc…) and avoid any undesirable collateral damage within the sea clutter. Look very closely. Check and see the perforated areas of the barrel. Even that on the Mk.38 is shorter than that on the RALCO. The RALCO also has a longer barrel. Finally, the weapon station of the RALCO is higher and slimmer than that of the Mk.38. Admittedly, they look so similar as to confuse most people though. Perhaps the Singaporeans cloned and modified the Mk.38 while reducing the calibre. Correction taken, education gotten. However they do look a lot alike. Mean machines though. he twin barrels boforss 40mm ( dardo ciws), the shells are heavier than the phalanx 20mm, but dardo has much lower rate of fire,than most ciws…… But it’s longer range is it’s advantage, as it detroyes the target further.so it offers better protection…to crew and ship electronic toys outside,of the ship…… I won’t call the ralco a ciws, as it lacks fire control radar and radar tracking….. I will rather call it,humourously a ships sniper rifle….. Though it is not a sniper rifle oh!! whatever be the case I WOULD NOT WANT TO BE ON SHORE ON THE RECEIVING END OF THIS TYPE OF tree cutting, mangrove clearing fire!! !